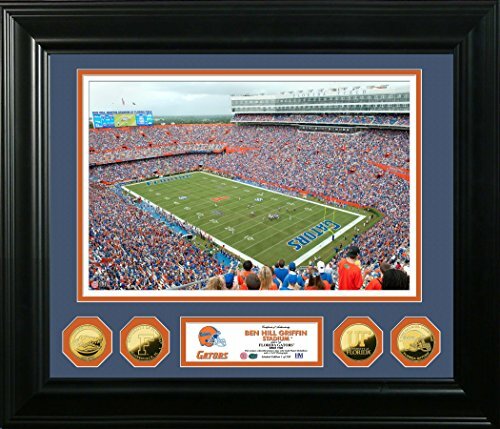 The Highland Mint features a 13"x 19" Photo of The Gators Ben Hill Griffin Stadium in a 24"x30" frame with 3" wide custom Molding and triple matting with four 24KT Gold flashed 39mm Minted Commemorative Coins as well as a numbered Certificate of Authenticity. Featured with the photos are three 24Kt Gold flashed 39mm Commemorative Coins struck with the University Emblems, a as well as a 24KT Gold flashed 3-time National Champions Coin! Limited Edition 250 and Officially Licensed by CLC.